I went to New York City for BlogHer12; an annual blogging conference for women. This year it was attended by some 5000 women bloggers! It’s not like it’s a homework assignment, but every one of us who went, has a blog, and feels compelled to share our opinion on the event. Prior to going, I read all the blog posts about what to expect, and what to wear, what to bring to BlogHer. I heard ALL about the insane amount of “swag” people can get- so much that many pack a suitcase inside of a suitcase when they come! I confess, I was more there for the networking, and people meeting then for the free ‘swag’ and as a food allergy blogger, let’s face it- most of the BIG swag-giving sponsors are not a good fit with me. I don’t coupon, or do retail stuff, and I strongly believe in the products I review. I feel like I spent a certain amount of it wandering around a bit in a daze, not sure where to go, or what to do. There were many booths you can visit from different sponsors in the Expo of the conference. Many of them were not of particular interest to me, but I was very happy to see SoDelicious Coconut Milk company there, as well as running into a couple of gals from Applegate Farms. We LOVE their turkey hotdogs, deli slices and turkey bacon; since the boys are allergic to beef and pork! I chatted with many of the vendors about food allergies, including the Cotton industry rep, since my boys are allergic to cottonseed. I chatted with the Kikkoman lady, Chef Helen Roberts, to ask if rice vinegar is made from yeast as a starter, which she could not answer but wants me to contact her via email to ask [on the to-do list]. There were many educational sponsors I chatted with about their websites, programs, Zamzee- an exercise tracking device, and more I think we may benefit from, and look forward to sharing with our school board and principal. I was not nervous about going, just excited to meet some of the other bloggers and twitter friends I have been following. BlogHer was a great experience. I could have probably done more, and really should have attended more classes. There is A LOT to absorb in a short amount of time. I had so much fun meeting some of the humor bloggers I really enjoy, Leslie at The Bearded Iris, and Jen at peopleiwanttopunchinthethroat who both brighten many of my days with a needed laugh! [You can read all about my adventure with Jen here]. I was so happy to meet Colette Martin, author of my favorite allergen-free cookbook, Learning to Bake Allergen-Free. You can read my review of her book here. She was just as nice in person as she is on twitter. I am grateful everyday for her contribution to those of us dealing with food allergies- if you don’t have her book yet, I highly recommend it! I also ran into a few of my other friends and met many more. I was blessed with many, as I call them, “An Angel Smiles” moments. I saw a woman, she was put together, and professional looking. I thought I recognized her, so I followed her out of the session, and down the hall to ask her who she was. I did not know her, but when she learned my blog was about food allergies, she got teary eyed, and told me her 11 month old was diagnosed the day before the conference, with peanut and egg allergies. She was feeling completely overwhelmed. Of course I too became teary eyed, and we hugged and I told her there was a reason I felt compelled to follow her out and to meet her! She was so grateful to hear about my blog, and to have a place to start her journey. THAT is why I do this, the purpose behind this site. I remember those feelings, from when we first heard that diagnosis of life-threatening food allergies, of helplessness, fear, overwhelmed, and just not knowing where to start. 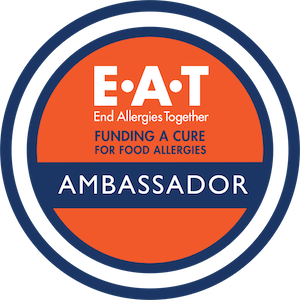 I want to be there for other people, so they can get the knowledge they need to keep safe, and to ease the stress of adjusting to a allergen-free lifestyle. I wish we could have asked everyone there about food allergies! It would have been amazing to see how MANY hands would have gone up! I met dozens of people who told me they had older children with food allergies, they themselves had them, or their child’s classmate. I KNOW the statistics on food allergies- [1 in 12] but even knowing this, it really surprised me how many people I met who could relate! I met one woman who was so happy to hear that there were actually allergen-free recipes for pancakes!~Her child had never been able to have them because of his allergies-and she just did not know it was an option! I was also so happy to see soy delicious. Meeting you was so great since I never met another family dealing with such similar allergies to ours. Love to you. Jenny, it was such a joy to meet you in person! You are as bright in person as you are online! Food allergies are crazily prominent, but unless you’re personally impacted by them, you don’t think about them. My son had a corn allergy (weird, huh?) as an infant (I breastfed, so I had to cut corn out of *my* diet or else he suffered), and now while he is fine in terms of allergies, he is autistic, so we’re trying to limit his gluten intake. And there’s a child with a peanut butter allergy in my daughter’s class, so we have to be careful about what foods we send in with her. 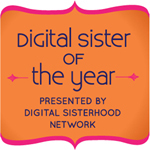 Thank you for sharing your experience at the BlogHer meeting. I thought about attending as well, but decided it wasn’t worth the cost to travel. However, reading your experience makes me wish that I had. I love your description of “an angel smiles” as well. I often get those same “coincidences” and can’t help but think that there’s a reason for it.